Penelitian - University of Otago researchers have used high-resolution electron microscopy images to reveal how an anti-cancer virus interacts with tumor cells, increasing its potential to save lives. The results from this latest study will help to develop the virus for clinical use. 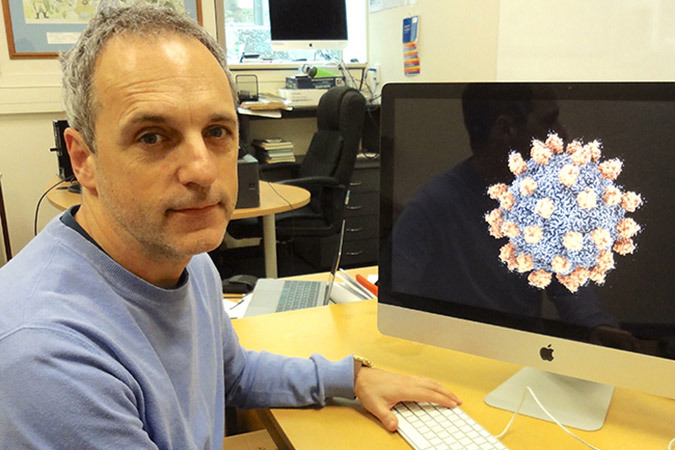 Seneca Valley Virus (SVV), a newly discovered virus which infects cancer cells but not normal tissue, has become a main research project in the New Zealand laboratory of Mihnea Bostina, Academic Director of Otago's OMNI Electron Microscopy unit and senior lecturer in the Department of Microbiology and Immunology. The structure demonstrates how SVV discriminates between its preferred receptor (cancer cells) and other similar proteins (healthy tissue). The virus is a strong contender for effective virotherapy because it selectively targets a receptor found only in tumor cells in more than 60 per cent of human cancers. "We can see exactly how the virus breaks into the cancer cells, while leaving other cells untouched. This structure teaches us which part of the virus is essential for binding to the receptor and which is not," Bostina says. "If we want to make the virus more efficient at invading cancer cells, we can leave intact the part that interacts with the cancer cells and modify the rest so the virus can escape the attack of the immune system," says Bostina. The receptor, a protein called ANTXR1, is expressed on tumors, but it has a cousin, ANTXR2, that only appears on healthy tissues. SVV doesn't bind with the similar receptor on healthy cells, it only shows strong affinity for ANTXR1. SVV has already demonstrated its cancer-fighting abilities in clinical trials, but there is one problem, the body builds up immunity to the virus within a couple of weeks. Bostina believes this study showcases the high quality of work being done at OMNI and hopes it will encourage the future funding of more challenging structural projects. Lead author and Otago PhD candidate Nadishka Jayawardena says he has "always been intrigued" by how naturally occurring micro-organisms can be used for human benefit. "Being able to work on a virus that can kill cancers is very rewarding, especially knowing that one day our findings could potentially lead to tackling a major global health issue," says Jayawardena.